Global growth is once again passing through a zone of turbulence. While growth will take place, it is nevertheless being revised downwards for 2016 and 2017 to 2.9% and 3.1%, respectively. The slowdown is first of all hitting the emerging countries, with the decline in Chinese growth continuing and even worsening (6.1% anticipated for 2017, down from 7.6% on average in 2012-2014). The slowdown in Chinese demand is hitting world trade and fuelling lower oil prices, which in turn is exacerbating the difficulties facing oil and commodity producers. Finally, the prospect for the normalization of US monetary policy is resulting in a reflux of capital. The dollar is appreciating even as the currencies of the emerging countries of Asia and Latin America are depreciating. While the industrialized countries are also suffering from the Chinese slowdown through the demand channel, growth is resilient there thanks to falling oil prices. The support provided by monetary policy is being cut back in the US, but is strengthening in the euro zone, keeping the euro at a low level. Countries are no longer systematically adopting austerity policies. In these conditions, growth will slow in the US, from 2.4% in 2015 to 1.9% in 2016 and then 1.6% in 2017. The recovery will pick up pace slightly in the euro zone, driven mainly by the dynamism of Germany and Spain and the improved outlook in France and Italy. For the euro zone as a whole, growth should come to 1.8% in 2016 and 1.7% in 2017. This will push down the unemployment rate, although by year-end 2017 it will still be 2 points above its pre-crisis level (9.3%, against 7.3% at year-end 2007). While the United States seems to have avoided the risk of deflation, the euro zone is still under threat. Inflation is close to zero, and the very low level of expectations for long-term inflation reflects the ECB’s difficulty in regaining control of inflation. Persistent unemployment indicates some continuing shortcomings in managing demand in the euro zone, which has in fact been based entirely on monetary policy. While the ECB’s actions are a necessary condition for accelerating growth, they are not sufficient, and must be supplemented by more active fiscal policy. At the level of the euro zone as a whole, overall fiscal policy is neutral (expansionary in Germany and Italy in 2016 but restrictive in France and even more so in Greece), whereas it needs to be more expansionary in order to bring unemployment down more rapidly and help to avert deflationary risks. Furthermore, the continuing moderate growth is leading to the accumulation of current account surpluses in the euro zone (3.2% in 2015). 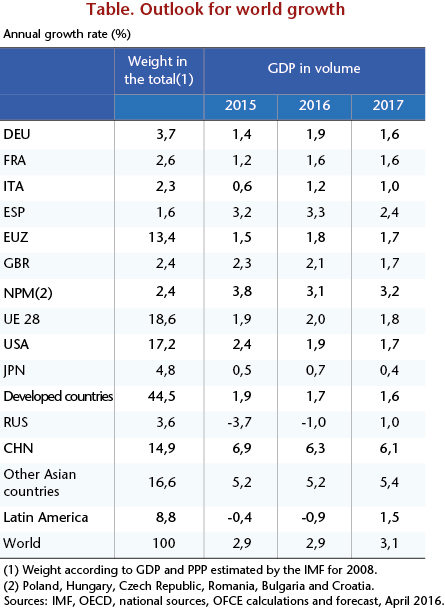 While imbalances within the euro zone have been corrected to some extent, this mainly took place through adjustments by countries in deficit prior to the crisis. Consequently, the surplus in the euro zone’s current account will eventually pose risks to the level of the euro, which could appreciate once the monetary stimulus ends, thereby slowing growth.